Doin’ Destin | So Many Exciting and Beautiful Places! After leaving the cruise ship, we flew to Pensacola to visit friends, Steve and Joan, and met them for dinner at Jaco’s Bayfront Bar and Grille. After a great meal, and even better conversation, we headed to Destin, where we had rented a condo at the Holiday Beach Resort. It was well located, near plenty of restaurants, shops and movie theaters. The only available unit was a one bedroom studio, so it was pretty cozy, but very well laid out. and it fronted on a beautiful white sand beach.This part of the resort is about 30 years old, and could use some updating, but it was well maintained and the staff were amazing! The temperature this week was on the cool side, but still about 50 degrees warmer than back home. On Wednesday, we drove into Pensacola to have dinner with Steve and Joan and several of their friends. After wine at Seville Quarter, we met their friends at The Fish House, where not only was the food good, it was Ladies’ Night, with $2 drinks on the veranda. We enjoyed meeting these new people, and hope to count them as friends as well in the future. On Thursday evening, Steve and Joan came out to Destin to spend the night in our cozy little home on the beach. After putting some of the furniture on the attached porch, we were able to open out the sleeper sofa for them. They brought along several games and taught us how to play Farkle. Loved it! The four of us started out the morning with breakfast at the Donut Hole Bakery and Cafe. We’d all driven by it, and through it would be worth a try. I ordered the granola pancakes and was given enough to feed the whole table. They were so good, I wished I could have eaten them all. 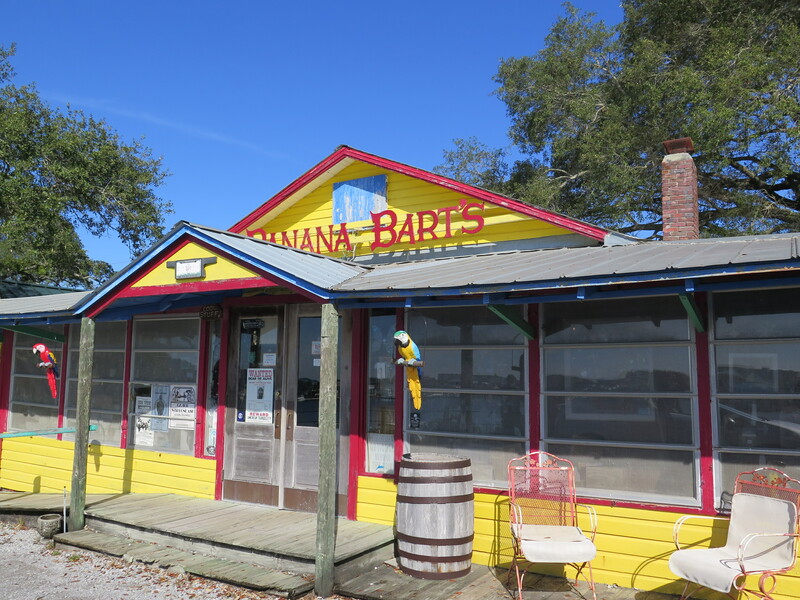 Next stop was Banana Bart’s, a gift shop just jam packed full of goodies: clothing, jewelery, knickknacks, and artwork. The shop overlooks the harbor, and was the first vacation house in Destin. It took about an hour to see everything – we didn’t want to miss any treasures! Then to Harborwalk Village, where we did some shopping, and had lunch at Margaritaville. There is a wonderful art gallery, Special Touch Gallery, featuring works by many local artists. We oohed and ahhed over many items, and purchased a few items as well. Steve didn’t do too well on the climbing wall. Joan and Steve show off their parrot from Special Touch Gallery. Samp0ling “The Jester,” supposedly the strongest drink in the world. We stayed in Pensacola tonight with Steve and Joan so we would be closer to the airport in the morning. We taught them how to play one of favorite, though perverted, games: Cards Against Humanity. It was a night full of laughter. Back home again, where the temperature was in the upper 30’s – a virtual heat wave – which made it a little easier to tolerate. This entry was posted in Florida, USA Travel. Bookmark the permalink.